I know this query seems lame — it’s just a SELECT FROM statement. 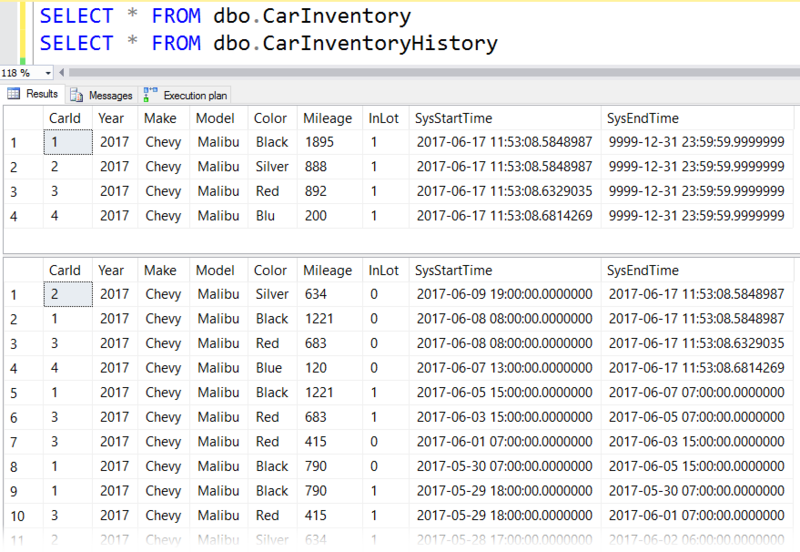 There are no FOR SYSTEM TIME clauses, WHERE statements, and no other interesting T-SQL features. Once again, there isn’t anything too fancy going on here — but that’s the point. With temporal tables, your data is organized to make analysis easier. Here we use CONTAINED IN because we want to get precise counts of how many cars were rented and returned in a specific date range (if a car wasn’t returned — stolen, wrecked and totaled, etc… — we don’t want to purchase more of those colors in the future).